Important: These are the expansion pieces only. If you do not already own the base rack, then these expansion racks are not what you want. If you are interested in the base rack, then check out the links below. 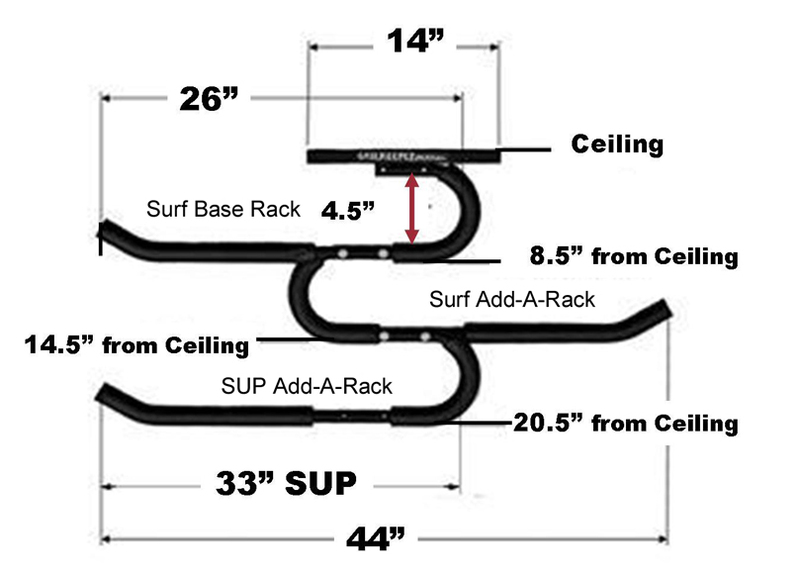 These racks are the expansion racks for our popular SUP Ceiling Rack and Surf Ceiling Rack. Due to the popularity of our expandable SUP and Surf ceiling racks, we are now offering just the expandable sections! Many of our customers have been so happy with their base rack that they have come back requesting to order the expansion pieces. We're happy to provide them! The expansion racks come in either a SUP or Surf variety. The difference between each type is the width of the rack. The SUP expansion rack is slightly wider to accomodate the larger SUP boards. There IS cross-compatability between the SUP and Surf base and expansion racks. To put it another way, it is OK to use a SUP base rack with a Surf expansion section and vice-versa. Please note there is a slight upcharge for the SUP rack. Please remember that the maximum recommended number of boards held is 3. This could be 3 SUPs, 3 Surfboards, or any combination. Surf expansion rack width: 26"
Surf rack board-slot height: 4.5"
SUP expansion rack width: 33"
SUP rack board-slot height: 6.5"
Total assembled width of surf base + surf expansion: 44"
Total assembled width of SUP base + SUP expansion: 53.5"
To hold three boards from the ceiling do I need a base rack and two expansion racks? I am interested in buying a roof rack. I need to keep store 3 SUPs. How do I order that option? You can then order the system for 3 SUPs, it in the drop-down menu choosing: "Base SUP rack plus (2) SUP expansion rack" This will give you the base rack that is sized for a SUP as well as two more levels that will hold two more SUP-sized boards.